Hyderabad’s most wanted gangster Nayeem was killed in a shootout by Greyhounds police in a gated community township at Shad Nagar in Mahbub Nagar district, about 70km from city, in the wee hours of Monday. On confirmed information about the gangster’s movements, the police swooped on Millennium Township where Nayeem was camping at the house of one Basha. On sensing trouble, the gangster’s gunman opened fire on the police who retorted killing Nayeem on the spot. A former naxalite and a native of Bhongir in Nalgonda district, Nayeem came out of the extremist group and then turned a police informer. The police department had used him to nab or kill other naxalite leaders. However, Nayeem later turned hostile to the police and he was an accused in the murder of IPS officer K.S. Vyas. 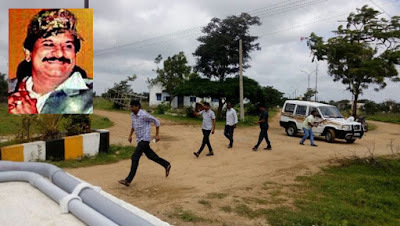 Nayeem openly declared naxals and police as his enemies and killed several naxal leaders including Ramulu and Sambasivudu who joined TRS after leaving Maoist group. Nayeem was also an accused in the murder of other civil rights movement leaders in the past 20 years. The gangster with his naxalite training and organizational tactics managed to build his teams for his underworld activities and gradually became a Dawood Ibrahim of Hyderabad. He was reportedly involved in several land settlements and amassed money and properties. Telangana DGP Anurag Sharma confirmed the death of Nayeem and more details will be disclosed by him later today. Whether any of his followers were also killed in the shootout or anyone arrested is not known yet.